So people have asked me, what do I find disgusting or horrific in horror films? You know by now that I roll my eyes at the Saw series, and positively chuckled through Hostel, and for the most part nothing has freaked me out as much as old films and television shows I watched when I was younger. Fear is one thing however, but to be disgusted, horrified at something is different; a sensation of complete discomfort down to the pit of your stomach… and all the way back up again. At some point during my teens I stumbled upon a film on television, late at night, which remains the only film to ever make me feel physically sick and have to turn it off. 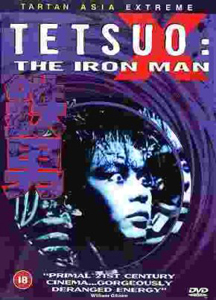 I had never tracked it down since, and it had become something of a legend in my mind, so just for you my humble readers, on this October, I dared subject myself to Tetsuo – The Iron Man once again. Tetsuo – The Iron Man is an angry, disturbed and visually unpleasant experience that is dedicated to keeping you in a state of discomfort. None of the characters are named, and the film begins with a man with a “metal fetish”, who proceeds to cut open his thigh and jam a metal bar into his leg. He is then hit and terribly wounded by a car driven by a businessman, a businessman we then follow as he is inflicted by a strange disease after the incident. A disease that is slowly transforming his body into metal. The film is shot entirely in black and white, and this is just one reason why the film feels potent; the film shows unnatural transformation from the realms of science fiction horror in a natural setting, so the b/w tones only add to the gritty, dreamlike grunge horror the film relishes in. That and how the camera is constantly lurching around, ducking and diving, weaving and bobbing (climaxing with rapid editing and low frame rate shots and stop-frame animation, jarring the brain). The music is thumping, metallic and repetitive. Everything about the film is unpleasant to watch; it is the actual film equivalent to having a drill bored against your skull. It is like a live action H.R. Giger painting, that’s the best way I can describe it. The first and second acts are definitely the hardest to watch; rooted in real life, the film has a nightmare quality and explains little to nothing, you are merely subjected to not only horrific visuals, but also deranged and nonsensical direction! The final act goes off the deep end and breaks fully into science fiction metaphysics as the man’s transformation becomes total, but it is also when the plot reveals itself. I… don’t recommend this to anyone. I watched it as I knew what I was getting myself into, but the initial shock will stay with me forever. Only the Japanese could make something so psychotic and horribly mesmerising.